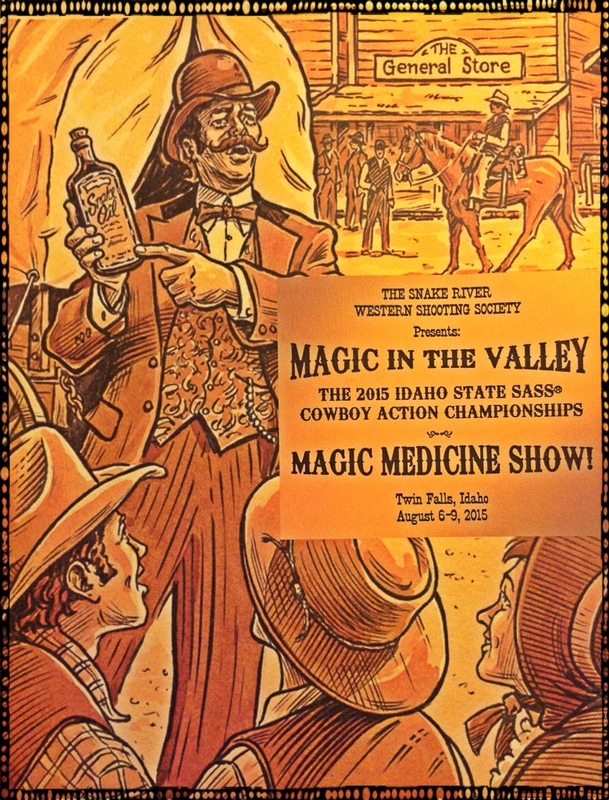 This years Idaho State Championships hosted by The Snake River Western Shooting Society presented Magic In The Valley – Magic Medicine Show. 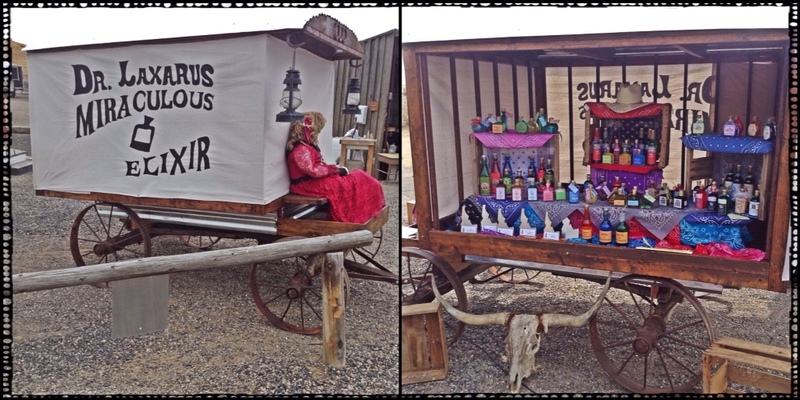 One of their members Idaho Calliope Kid built a little medicine man wagon and the ladies, Missy Mable (also Match Director), Sweet Harmony and a few others (I'm sorry I don't have their names) came up with some priceless medicinal labels for bottles of varying shapes and sizes which became the side match and costume prizes. The stages were well written, based around various medicinal concoctions and remedies from back in the 1800's. There were little signs almost everywhere and their decorating of stages definitely added to the atmosphere. Thursday was side match day that started with a 1911 match, then we had speed events and onto warm up match. 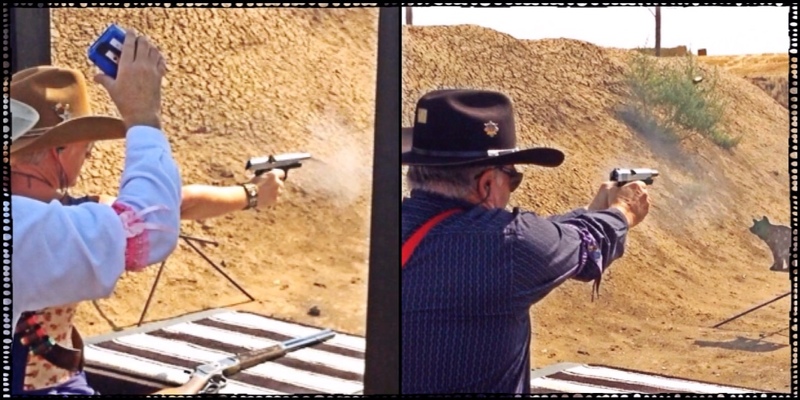 After shooting the 1911, hands were back into single action mode and ready to go. Friday's 6 stages went well, great weather, great posse. 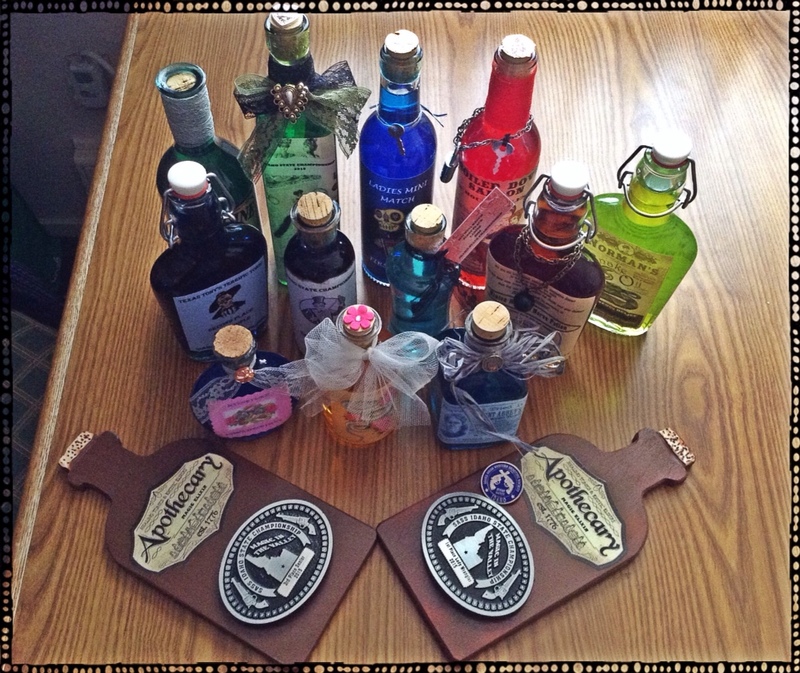 Our Posse – Allen Street Contessa, Colter's Girl, Idaho Bad Company, Idaho Dusty Dawn, Idaho White Rider, Jackaroo, Kathouse Kelli, Kid Colter, Li'l Shotz, Marshal Stone, Missy Mable, Pintail Bandita, Silver Shadow and Twelve Mile Reb. Clean for me and 1 miss for Jack. After lunch we had couples – real and odd – and then a four man team event. Jack and I won the couples, Colorado Blackjack and I were 2nd in the odd couples. Jackaroo, Waddell Red, Sweet Harmony and Idaho Shady Layne won 2nd place in the team event. Friday afternoon we hung around, cleaned guns and the car whilst waiting for a visit at the airport. Airport? You ask. Well here's why. One of the cowboy shooters, Lefty Way, works for a company called Airpower Unlimited, and is part of a restoration team for old planes. Yes, I'm talking Corsair's, Mustang's and more. 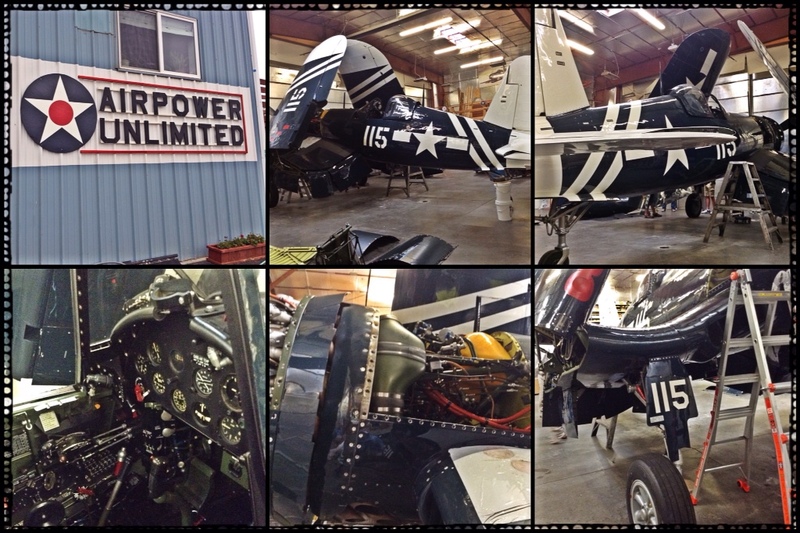 He took a handful of us to go see a Corsair they have been restoring. There is also a Mustang sitting in the shed. Well pilots, and wanna be pilots drool. The guys loved it and asked all the technical questions and even for Second Fiddle Sue and I, it was a sight to behold. The Corsair is one of around 30-40 Corsairs left in the world, (most were used for the series Baa Baa Black Sheep if you've seen it, we haven't) having spent most of its time in Hawaii it didn't actually see war time as such. Now it is privately owned and once fully restored will go back to its owner in Washington (?) to his museum and personal flight enjoyment. It is also one of the last models of the series to be made with 3 blades. Her paint work has been colour matched and finished to the original Fed specs/technical order. During WWII there were around 12,000 made. Lefty said it is one of the most complex aircraft they work on, even compared to the Mustang's. They've been working on this one on and off for 11 and a half years – approx 38,000 man hours so far. It was spectacular, thanks Lefty Way! As you can imagine Jack thoroughly enjoyed it and had to get a picture with the Mustang as this is what his Dad flew during WWII in England. 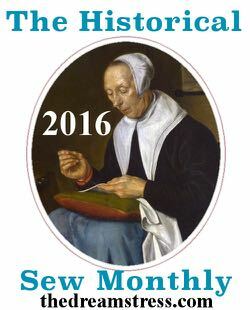 Anyway, back to our featured program. Saturday and we get into the last day, 6 stages. Same finish, Jack 1 miss and me clean! Yippee! Only 3rd clean match ever, actually maybe 4th, think I had one clean match at Chisholm Trail (AUS). Saturday night was banquet and awards. Jack finished 3rd in Senior, congrats to 1st Place, Jeremiah Jonathon; 2nd Place, JT Wild; 4th Place, Gem Hunter and 5th Place, Mizpah Pete. For Lady Wrangler, I finished 1st Place and a big congratulations to 2nd Place, Sweet Harmony; 3rd Place, Ruby Q Hammer and 4th Place, Colter's Girl. Top honours overall went to Colorado Blackjack 1st Place, Kuna 2nd Place and the Idaho State Mens Champion and Twelve Mile Reb 3rd Place. I finished 1st Lady overall in 9th place and Jack finished 11th overall. Finishing 17th overall and Idaho State Ladies Champion is Belinda Belle. Congratulations to all who played! Sunday was the shootout won by JT Wild for the men's, Tadpole for the juniors and myself for the ladies. However, I am embarrassed to say that it should have been Missy Mable. The video ref says so when Jack and I watched it back (I nearly died), an absent minded moment which should have been called on by the spotters and declared by myself, so I put in a call of apology to Missy Mable. That's what cowboys and cowgirls should do, it's the cowboy way. 'Nuf said. 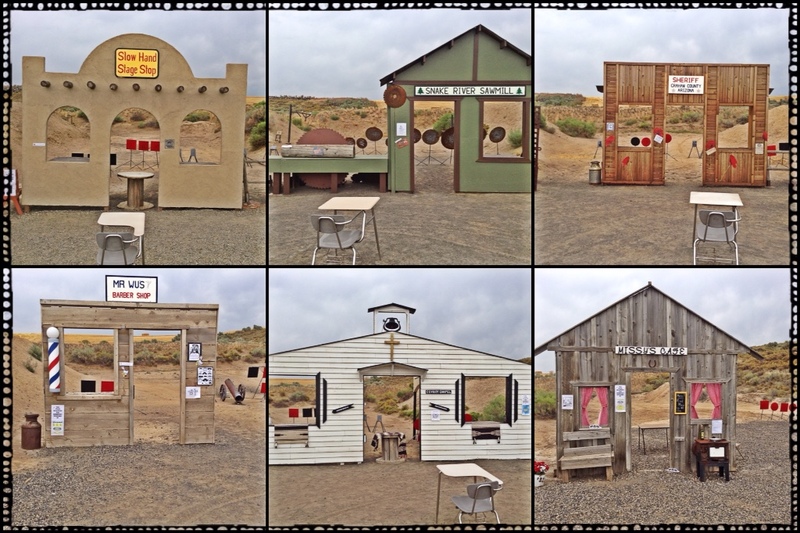 Once again a hearty congratulations to all those with the Snake River Western Shooting Society for putting on an entertaining, well put together match. We thoroughly enjoyed it and the perfect shooting weather! It truly was magic! 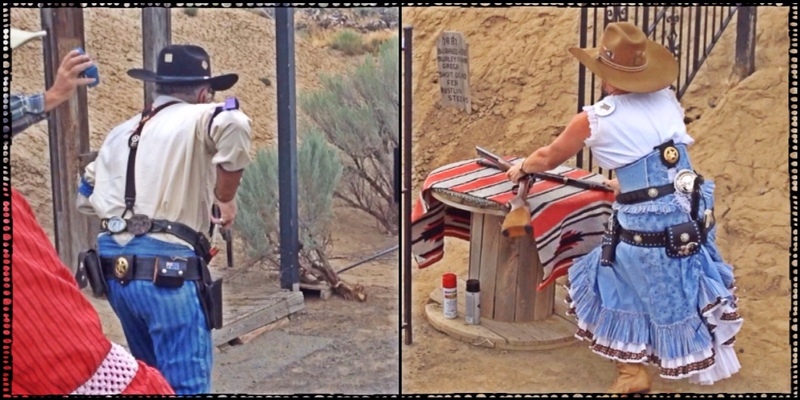 This entry was posted in Love My Life, SASS and tagged cowboy action shooting, friends, Idaho, Jerome, Single Action Shooting Society, Twin Falls, USTrip. Bookmark the permalink.